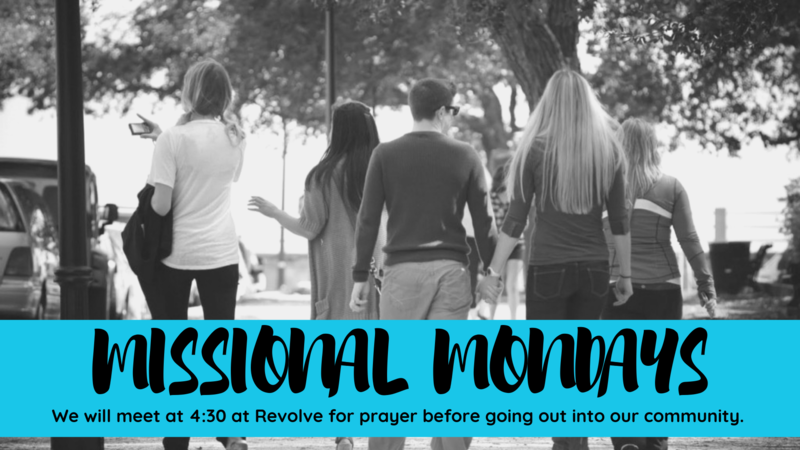 Please meet us at Revolve Church on Monday evenings as close to 4:30pm as possible for a time of prayer and then being sent out in small groups for 'missional rhythms'- times when we intentionally go out to pray for our community and try to have spiritual conversations. This might look like going to the playground with a few other families, going on a prayer walk, going to a local restaurant, or any other normal activity- just done with purpose. Please feel free to bring your whole family. If you cannot come right at 4:30, please come when you are able. If we are no longer on site when you arrive, we will leave contact information on the front door. We will gather, pray and game plan until 5:15pm and then go out from there until around 6:30.